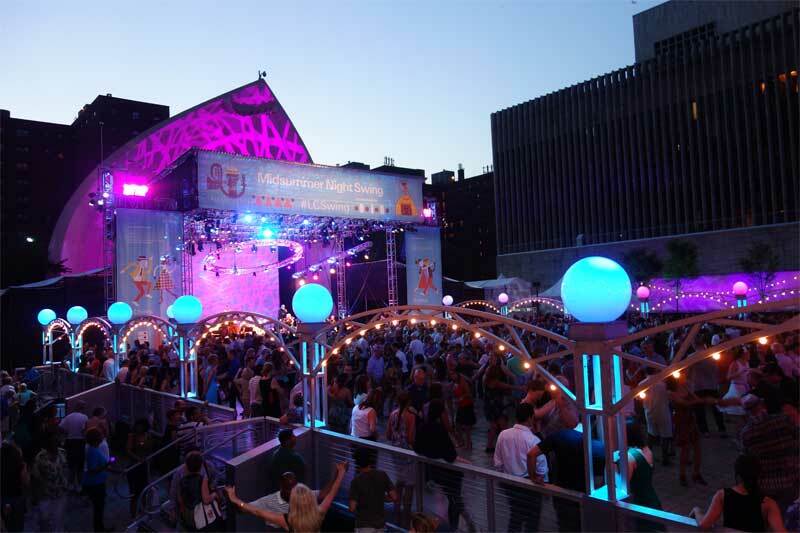 If it is July—and sure has been hot enough to be July—then it must be time for Phast Phreddie the Boogaloo Omnibus to make a guest DJ appearance at Lincoln Center’s fantabulous Midsummer Night Swing series of dance concerts held in Damrosch Park in Midtown Manhattan. Last year—and especially the year before—The Boog’s MSNS night was rained on. This time the weatherman went the other way: a very clear sky with hot, hot heat that made one burning, swingin’ night! Eva Carrozza leads a crew of dancers as they teach the Lindy hop at Midsummer Night Swing! 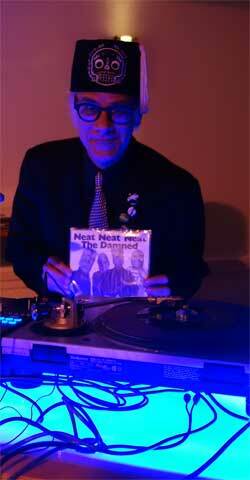 On July 6, the evening started with a DJ set by The Boog that included some jumpin’ and swingin’ numbers. 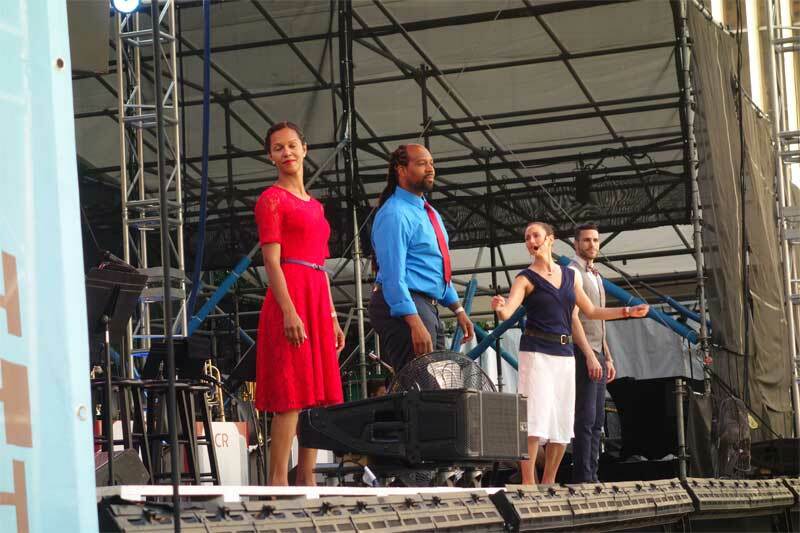 Then dance instructor Eva Carrozza and her crew broke quite a sweat as they taught the audience how to Lindy hop. Once the folks on the dance floor were fully in command of their dance steps, The Boog returned to the turntables as they were able to Lindy hop to more jump and swing music, commencing with the great Wynonie Harris’ version of “Good Rockin’ Tonight” (and including Joe Turner’s “Boogie Woogie Country Girl” in a small tribute to Doc Pomus, who was honored at last year’s rainy event). The headliner for this evening was the pre-Beatles, Philadelphia teen sensation Bobby Rydell. From 1959 to 1963, Mr. Rydell released more than two dozen teen pop hits, including “We Got Love,” “Swingin’ School” and “Forget Him.” But Bobby Rydell—much like all the “Bobbies” of the time: Bobby Darin, Bobby Vinton, Bobby Vee—aspired to be a vocalist in the mold of Frank Sinatra. (Even the “anti-Bobby,” Bob Dylan, eventually had such aspirations!) Thus, ably backed by Philadelphia’s City Rhythm Orchestra, Mr. Rydell presented a set of mostly songs from the great American songbook, sung in a very Sinatra-like manner. 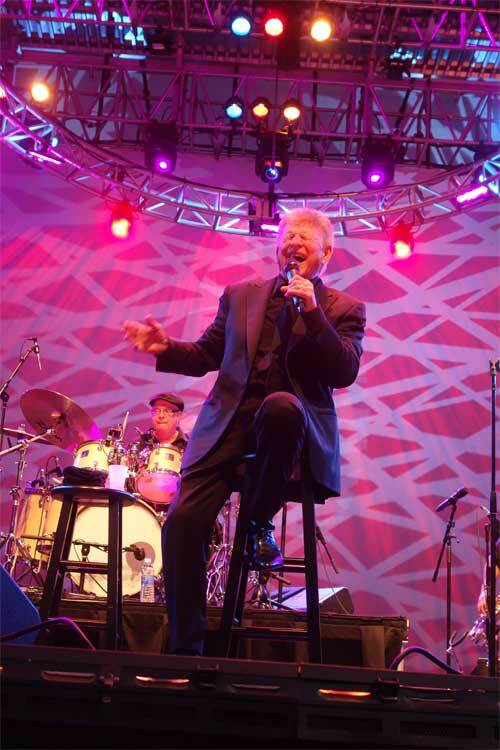 Bobby Rydell swings at Midsummer Night Swing! If you are familiar with Bobby Rydell from just a handful of his hits (“Kissin’ Time,” “I Dig Girls,” “Ding-A-Ling”) you may scoff at the idea. Don’t. Mr. Rydell has a commanding voice and he was able to carry this off much better than any lounge singer. Although he did not sing any of our favorites (“The Fish,” “The Cha Cha Cha,” and his cool version of The Kinks’ “When I See That Girl of Mine”), he did perform “Wild One” and “Sway,” ending his portion of the show with “Volare.” Once he was off the stage, The City Rhythm Orchestra continued to swing for another half hour or so, much to the delight of the dance floor inhabitants. When the big band was through, soaking with sweat every one of them, The Boog barely had time to play four more songs. 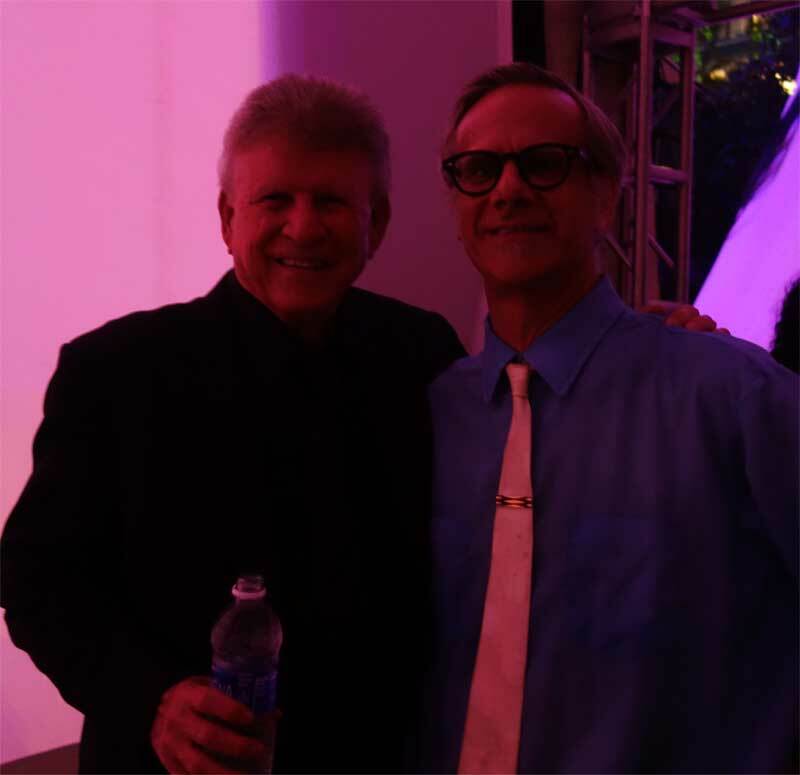 Bobby Rydell and Phast Phreddie the Boogaloo Omnibus discuss the finer points of early sixties Philadelphia pop music after Bobby’s performance at Midsummer Night Swing! Friends and Fireworks on the Fourth of July! 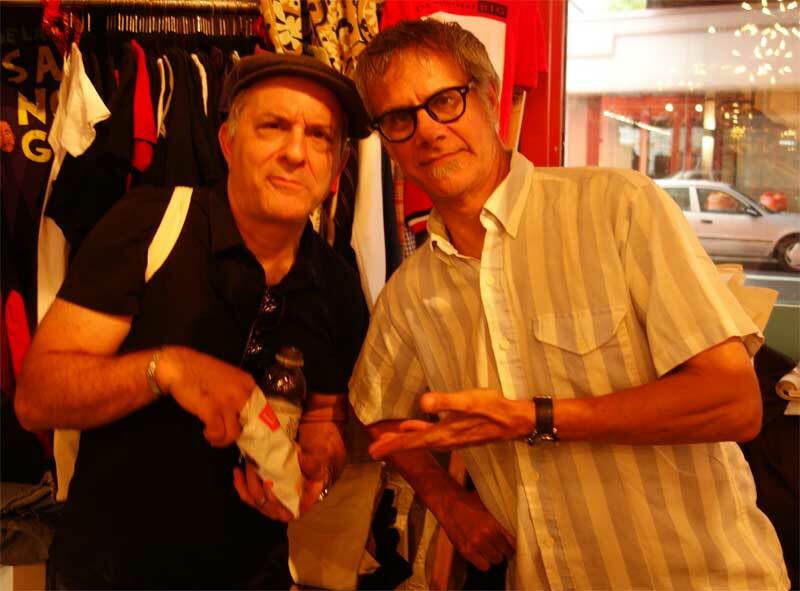 Ol’ Stark and Phast Phreddie the Boogaloo Omnibus swing at Artists and Fleas on the Fourth of July! Fourth of July is always a fun time and on this Fourth there were two things made it even better: 1. Phast Phreddie the Boogaloo Omnibus was asked to DJ at the Artists and Fleas room at the Chelsea Market by Ol’ Stark, who sells records and groovy threads there. 2. Our old pal Marty Jourard was in town and dropped by to make the scene. As the astute Boogaloo Bag reader knows, it was just a couple days prior to the Fourth that Ol’ Stark joined Phast Phreddie the Booogaloo Omnibus at the Bootleg Bar in Bushwick for the WHAM-O WATUSI. That spirit of camaraderie carried over to the early evening of the Fourth of July when the Phast Man showed up at Ol’ Stark’s booth with a box full of surf instrumentals. Ol’ Stark passed out wine (The Boog had a diet soda), bags of salty cheddar cheese-flavored snacks and Artists and Fleas tote bags to those in attendance, making it a very festive occasion. 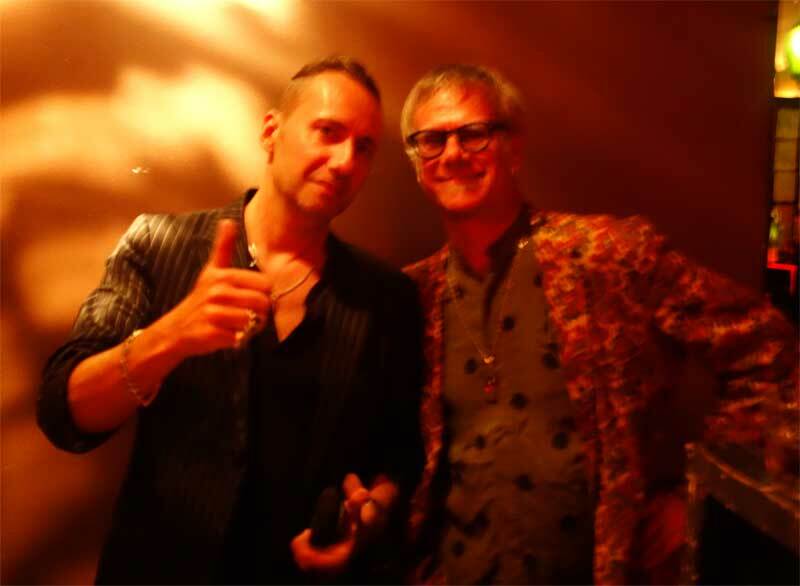 Marty Jourard and Phast Phreddie the Boogaloo Omnibus swing at Artists & Fleas on the Fourth of July! Marty Jourard, as the perceptive trainspotter will tell you, is the keyboard/saxophone player for the cool L.A. new wave band The Motels. 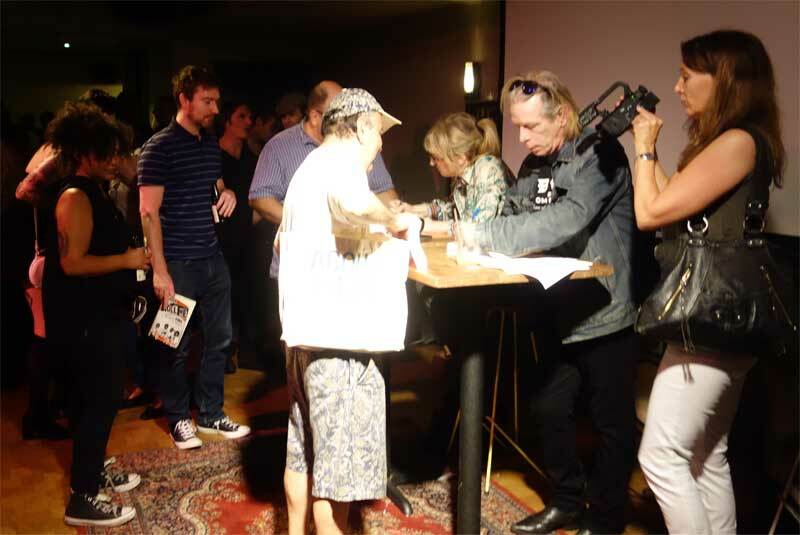 The Boogaloo Bag writers have known him since the late seventies, and indeed, he often played saxophone with Phast Phreddie & Thee Precisions. Marty also hosts a website that pays tribute to a saxophonist that both he and the Phast Man admire: Earl Bostic. Marty took part in the festivities, even going so far as to purchase a pair of sharp looking shoes from Ol’ Stark’s booth. 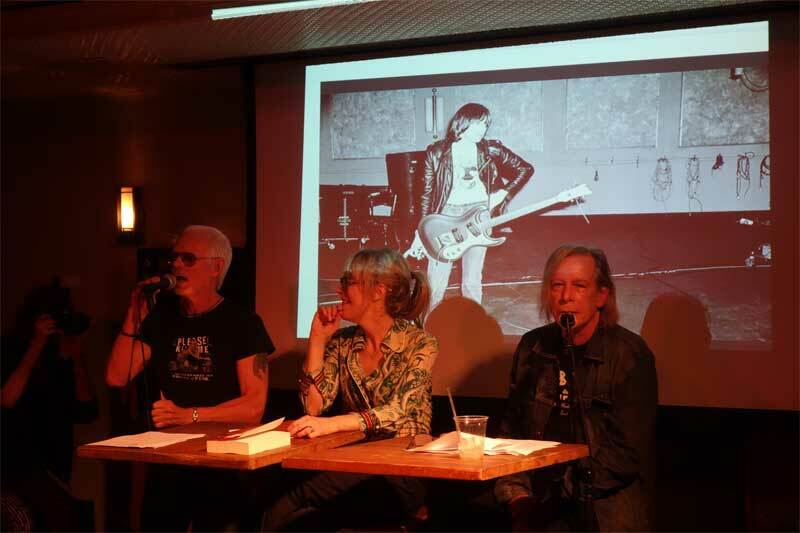 After The Boog played all 26 records he brought, he and his buddies hung out a bit, then he and Boogaloo Bag photographer Nancy “Jeannie” Gardner, Marty Jourard and his gal-pal Natalie walked not too deep into the West Village to an eatery called The Bus Stop, where dinner was served. It was great catching up with Marty. He has been touring with The Motels recently. 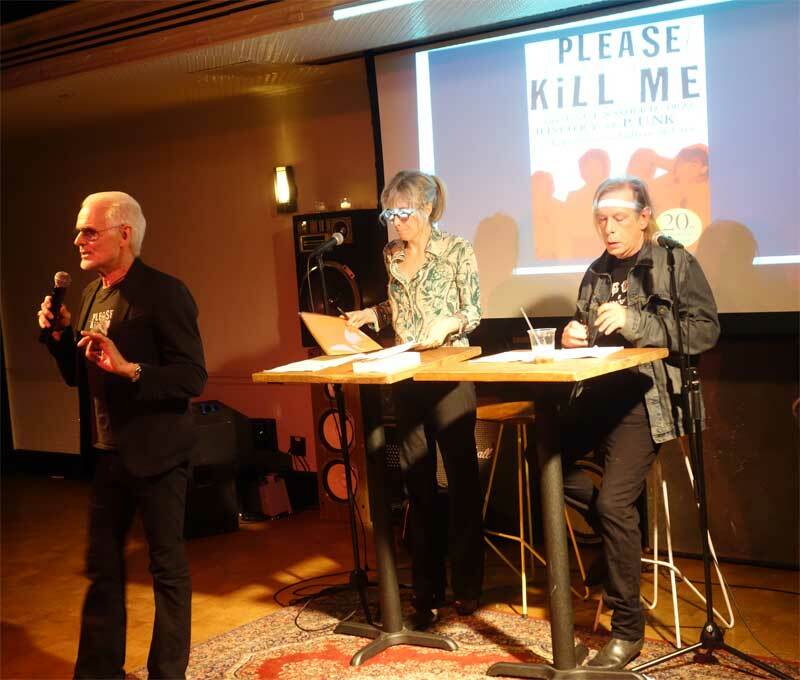 Also, he has just written a book about the music scene of his hometown Gainsville, Florida called Music Everywhere: The Rock and Roll Roots of a Southern Town. He was clearly excited about the good reviews and fine reception it has received. The Boog has just ordered a copy, and it comes highly recommended to Boogaloo Bag readers. After dinner, the group walked up to the High Line Park, back in Chelsea. 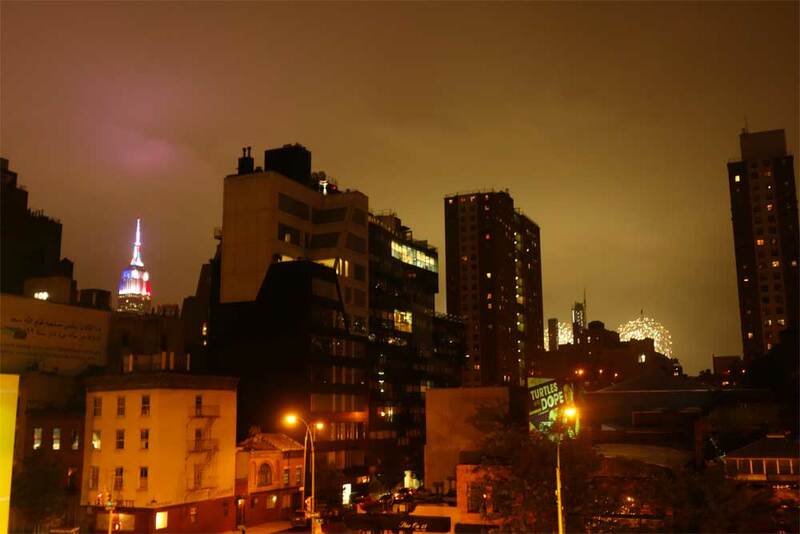 Although it was on the wrong side of Manhattan to properly see the fireworks, some pyrotechnics were observed between the buildings as it gently sprinkled. The Fourth of July, as seen from the High Line Park. The Phast and the Phrench!!! Ol’ Stark and Phast Phreddie the Boogaloo Omnibus swing at WHAM-O WATUSI! 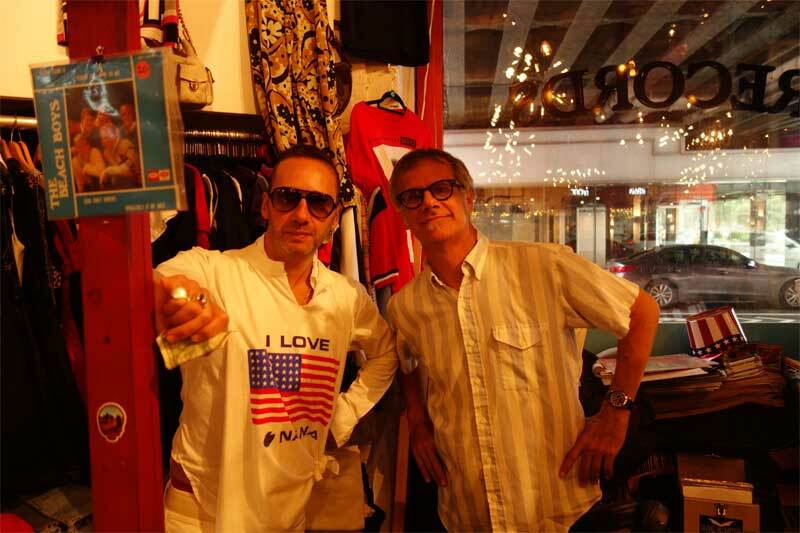 On July 2nd, the WHAM-O WATUSI returned to its internationalist theme with guest DJ Ol’ Stark. He is a Frenchman with some super boss international records, and man, did he play them! Ol’ Stark places another hot disc into rotation at the WHAM-O WATUSI! 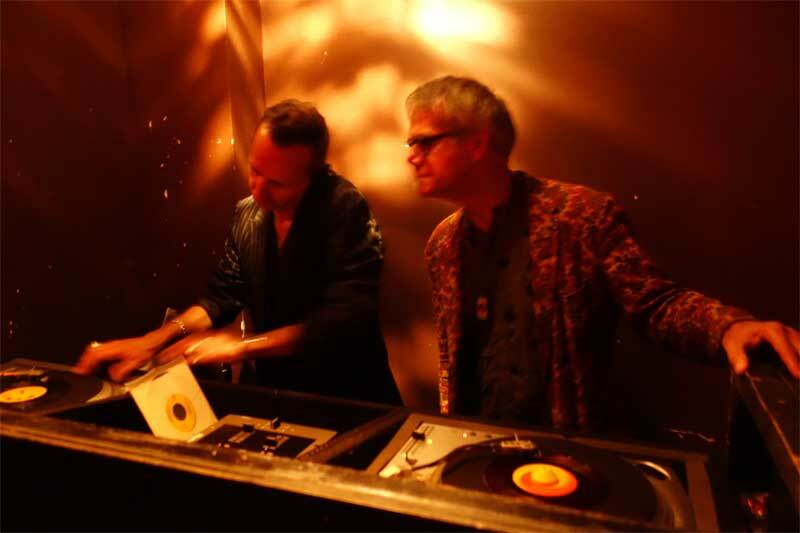 If you have been reading the Boogaloo Bag (and before that, the Boogaloo Blog), you will know that Ol’ Stark is one of our favorite DJs. 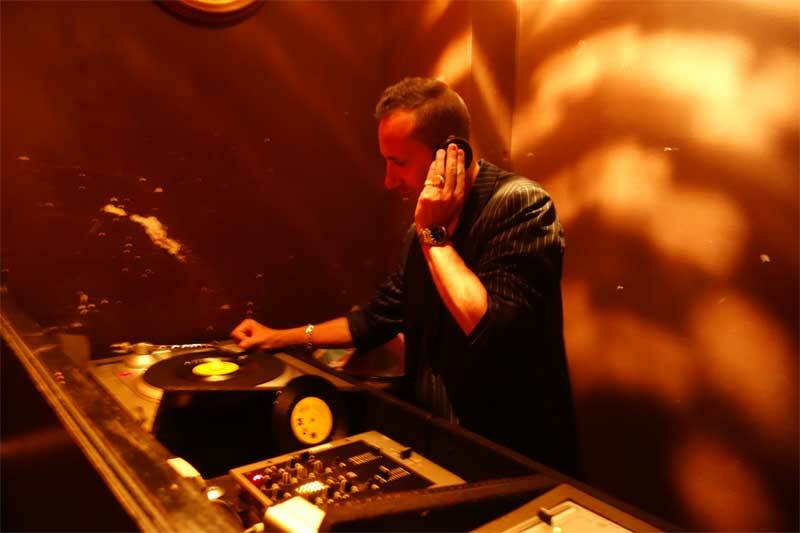 He has been a popular guest DJ at Subway Soul Club and his own Let’s Boogaloo was one of our favorite DJ nights. Currently, he provides the music for the Artists and Fleas room at the Chelsea Market (where he also sells records and groovy threads). 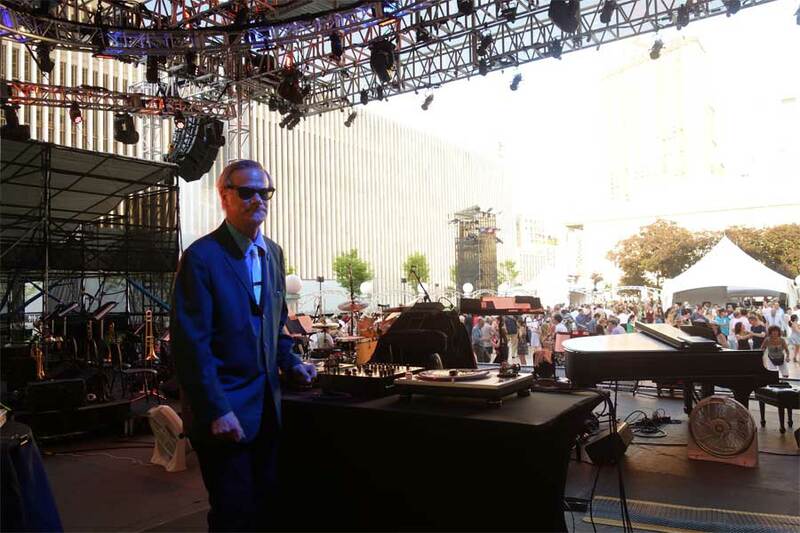 He has access to records from around the world, and he played a bunch of them at the WHAM. Ol’ Stark ques a boss record as Phast Phreddie the Boogaloo Omnibus looks on! WHAM host Phast Phreddie the Boogaloo Omnibus tried to help Mr. Stark feel at home by playing a whole slew of French language records (though many of them were from Canada!) and we think that the Bootleg Bar may have served more Burgundy wine that night than any other! Please note: The next WHAM-O WATUSI will take place on Saturday August 20 instead of August 6. In September it will return to the first Saturday of the month.